I was digging through the Damn Arbor archives yesterday and I came across this temporally appropriate article from November 2010. Hope you enjoy it. Harnois has a few hundred conventional turkeys this year compared to only a few dozen heritage turkeys. He says he likes raising both kinds, but prefers to eat the heritage breed. These turkeys come with more dark meat, and are generally more flavorful than their conventional cousin. Harnois went on gobbling with the turkeys as he explained the way his business works. There wasn’t any hurry to get the turkeys back in the cage. “I might as well just hang out here and wait. I won’t be able to get them back in the cage until my business partner gets home from school,” he said. 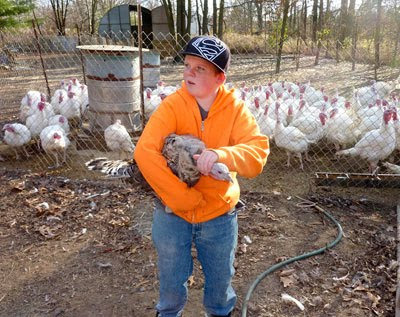 Just then, Nic came walking past the chicken coop, introduced himself and got to herding the flock back into their cage. You can read the rest of Quinn's article here.